I have been using these MAC Paint Pots for so long and I think I have gone through about 3 of them now, which is pretty good going for somebody like me that is constantly trying out new makeup. I also think that it is good going having gone through 2 of these because they seem to last for such a long time and I use them heavily on a daily basis. Before I tried these out for myself, I had never really tried an eyeshadow primer before and now I am absolutely hooked, and I cannot stop reaching for my MAC Paint Pot in the shade Soft Ochre. I am sure that most people will have tried this or at least heard of it before, but I still wanted to share my review with you guys. I first saw this on YouTube quite a while back because it seemed like everybody and their mothers were raving about this all over the internet. So, being the MAC whore that I am, I had to jump on the bandwagon and try one out for myself. I will admit that it took me a while to start using this partially because I am far too lazy to reach for it, but also because I don’t really go very extravagant with my eyeshadow in order to need to reach for an eyeshadow primer or base. But, I have to admit that when I did start reaching for this, I had to wonder why I hadn’t been using it sooner! Before I tried this MAC Paint Pot in the shade Soft Ochre, I was using the Urban Decay Primer Potion. I had been using that for such a long time because working as a freelance makeup artist, it was just the easiest thing to reach for. But, for some reason I seemed to be constantly running out of that stuff and to be honest, I didn’t feel like I used a lot of it. But, I am so glad that I finally upgraded to this product because I have to say that I have been loving it and I much prefer it to the Primer Potion. I took a lot of time to search through the different shades that they had to offer because I wanted to make sure that I get the right shade for my skintone. I went for the shade Soft Ochre because it is a light shade that I thought would match my skin tone pretty well, plus with the yellow undertone through the product I thought that it would do a good job at cancelling out the veins on my eyelids and give me a true blank canvas for my eyeshadow. I think I have to say that I think I got the shade selection pretty spot on, but I think in the future I would like to try the brown shade because it would be a great base for a smokey eye! What I have been really loving about this product is that it makes my eyeshadows show up very true to colour. 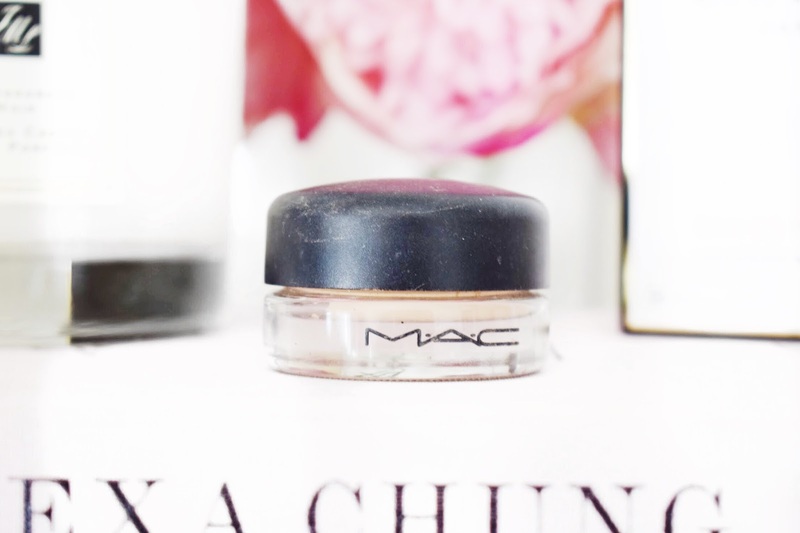 I can get a specific eyeshadow out of my draw and I know that the shade from the pan is going to be the exact same shade that shows up on my eyes and I put that down to this brilliant MAC Paint Pot. Because this does so much work cancelling out all of the natural tones around my eyes, it helps the eyeshadows to show up true to their shade on my skin. I have also noticed that this makes my eyeshadows last for hell of a lot longer than if I wasn’t wearing this or if I was wearing an alternative. Because this is a tacky consistency, I feel like it really holds your shadows or glitters into place so much better than if I wasn’t wearing this. Even if I am going for something neutral like a warm transition shade and a light wash of colour across my eyelid, I find that this does the job of keeping them all true to shade and in place all day long. Anyway, there really isn’t much more that I can say about this product. It hides imperfections and veins around the eyes, holds eyeshadows in place all day long and makes the shadows true to colour. I think that this is well worth the money and they last for such a long time. I will leave a link to this down below in case you want to check it out for yourself. Make sure to leave me a comment down below and let me know if you have tried this and what you thought about it, if not let me know what some of your favourite eye primers are and I will have to check them out for myself!